We need just a bit more theory before we can take the next step, which is broadening this monologue on systems from theory to principles of re-design and change. A little more theory might be a foundation of informed actions. 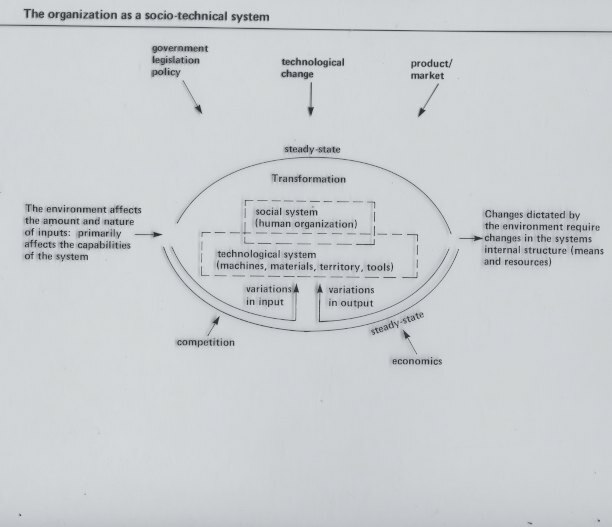 The diagram about the organization as a socio-technical system (below) is a useful view of the whole organization as an in-put Out-put System. These systems operate within boundaries subjected to the whims of environmental changes such as: economic crises, increased competitive threats and industry shifts. Customers often demand new and different things. When these happen the organization has to adjust. The organization is people and technologies, which are matched together to produce an outcome, a product or a service. People as individuals are matched to jobs and people within groups, which we call social systems, manage how the work is broken down into specialties, which have to rely on each other to coordinate steps to produce an integrated outcome. Think about an accounting firm. Accounting methodology, and its structure of rules, is no less a technology than an integrated production line. Think about consultant organizations – we are humans employing methodologies that experience leads us to believe benefit organizations. We have developed processes such as action research to help us make sense of the complexity of socio-technical systems. There are two things to remember about these input output systems. First, there is no one-to-one relationship between changes in the input and changes in the output. For example, different inputs may yield similar outputs and, different product mixes may be produced from similar inputs. Second, the technological component plays a major role in the self-regulating properties of an enterprise. The technology is a boundary, part of the internalized environment, but not only does the technological component set limits upon what can be done; but also creates demands that are reflected in the internal social organization and the organizations ends. We will see this better represented in our second systems view. 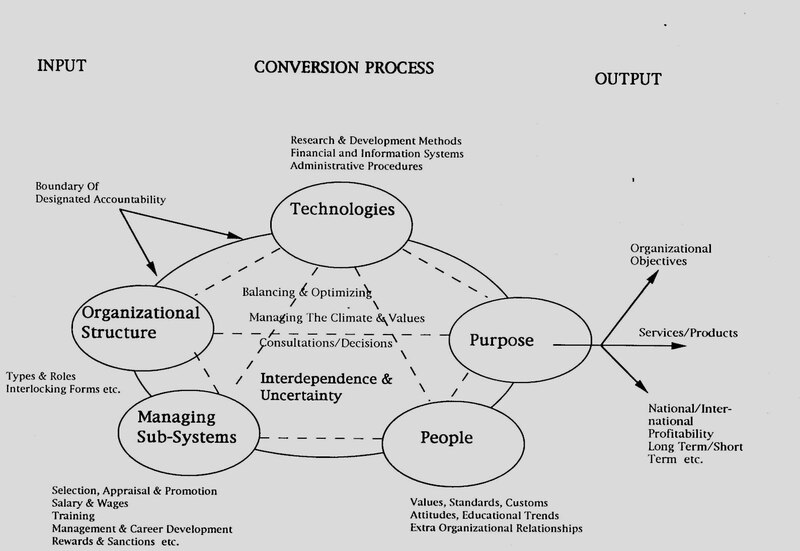 The diagram below is a broader and more encompassing view of organization which highlights that the principle challenge of leadership is to manage the uncertainty and the interdependence of the system as a whole, which is made up of people, technologies, structure, and support systems and the shifting and emerging demands on the purpose of the organization. Think of the change that has happened within this image in the last 20 years as we have moved into a global market. We have learned over the years that alignment of these various parts is critical, that the people, the structures, the tools and methods are aligned and integrated, and able to operate as a whole, is one measure of effectiveness. If we view organization as adaptive, organic structures, then inferences about effectiveness have to be made not from static measures of output, though these may be helpful – but on the basis of the process through which the organization approaches problems. In other words, no single measurement of organizational efficiency or satisfaction- no single time slice of organizational performance can provide valid indicators of organizational health.